My friend Maria is collecting misconceptions about bronies for a project she’s working on. If you are a brony and have encountered misconceptions about them, tweet the misconceptions @TheMadameMeow. You can also see some of the misconceptions she’s collected at bronymisconceptions.tumblr.com. She’s also looking for stories of people who met their significant others through fandom, so if you have, please contact her as well. Charles Dunbar is an anthropology grad student studying Japanese culture and U.S. convention culture (and also my editor). He’s seriously awesome and all of the reward levels on his gofundme are worth it. Kit Paige is a similarly awesome grad student studying Japanese culture. All of her gofundme‘s reward levels are likewise completely worth it. And of course you all know how awesome Viga is, since you can see the kickass logo she designed for me at the top of this page. And, you guessed it, the rewards on her gofundme are bargains as well. It’s December 22, 2012. Top of the pop charts is Bruno Mars with “Locked Out of Heaven,” the video for which fakes video tearing and chromatic aberrations to simulate an aging VHS tape, the filmic equivalent of an old photo album. Number one at the box office this weekend is still The Hobbit. In the news, right-wing nationalist Shinzo Abe is elected prime minister of Japan, the Mesoamerican Long Count calendar hits 13.0.0.0.0, which the Mayans never believed indicated the end of the world, and PSY’s “Gangnam Style” becomes the first YouTube video to hit a billion views, which very well might. And, of course, the winter solstice was yesterday. The winter solstice is a strange time. As the shortest day of the year, it is also the point at which the days begin getting longer, and is therefore celebrated as the sun’s birthday (or the Son, if you’re Christian and into puns). Traditionally, it marks the midpoint of winter as well, the day at which the time of cold, snow, and carefully rationed food is half over. However, at least where I grew up around the middle of the U.S. East Coast, it’s not the middle of winter at all, but very nearly the beginning. It is quite rare to see snow or freezing temperatures before the last third of December, and the peak time for snow is the end of January and beginning of February. Either way, it is a moment of transition, a signpost that there is cold and darkness ahead, but light and warmth beyond that. “Apple Family Reunion” (written by Cindy Morrow and directed by Jayson Thiessen) is thus an appropriate episode to show here, because after this come four episodes ranging from problematic to abysmal, and then the catastrophe of the season finale (though whether it was eucatastrophe or dyscatastrophe is a matter of some debate). Although the episode itself is bright and entertaining and has one of the season’s better musical numbers, a pall of death hangs over it. The episode carefully steps around mentioning Applejack’s parents, and in doing so clearly marks the outlines of their absence. It is perhaps the most skillfully executed part of the episode. To a small child who knows little of loss, the appearance of paired shooting stars twice in the episode mean nothing. 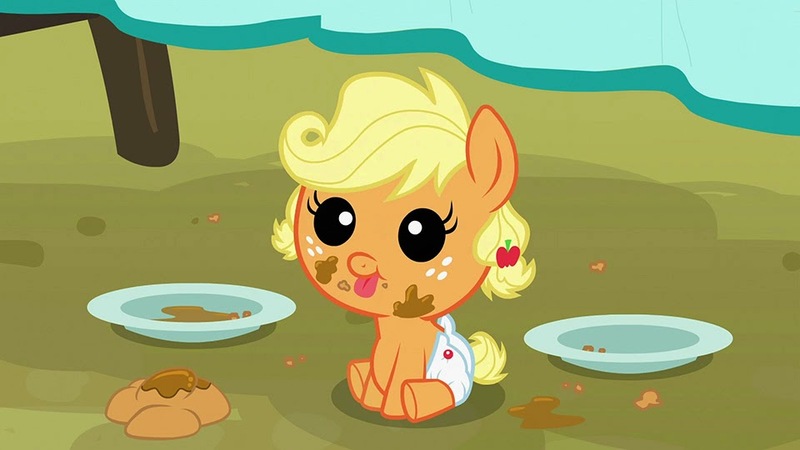 To a teen or adult viewer, however, the fact that Applejack’s parents do not appear at the reunion and are carefully not mentioned, as well as the timing of when the stars appear–once when Applejack’s thoughts are on absent family and her personal history, and then again at the end of the episode after the reunion’s successful close–makes those stars a confirmation that her parents are dead. Fans being fans, a proliferation of memes comparing Applejack to Batman shortly followed. Which is part of what’s going on here. Among other things, my article on “The Return of Harmony” was a sort of Gnostic parable, with Faust as Sophia, Hasbro as Ialdabaoth, and Discord as Christ. This was largely a joke, but at the same time, well, look at the third season. The second season at least had Faust involved with the scripts, and between that and the growing confidence of the cast and crew it managed to be stronger than the first season. But the third season? “Magic Duel,” “Wonderbolts Academy,” and “Magical Mystery Cure” stand out as being excellent episodes in the third season, but would not have made it even into the top five episodes of the second season. With Faust’s departure, the soul, the magic, is leaking out of the show–and it’s flowing into the fandom. Barely two weeks after the end of the season, the massive fan project “Double Rainboom” will be released. While not very good itself, the resources created for the project such as Flash puppets, and even more importantly the proof of concept that large fan projects coordinated across massive numbers of volunteers are workable, had an enormous impact on the fandom, spawning numerous other creative endeavors, the output of which far outstrips the norm for such a relatively small fandom. However, there is a problem here. If the magic leaves the show entirely and its quality plummets, then there is no fandom, and all that creative energy just fades away. The show must recover some of its lost magic, or find a way to generate new magic and explore new directions, if it is to continue. There are basically two ways to do that: experimentation or a return to original principles. The entirety of the season up to this point has been the former, more or less alternating between trying to force Friendship Is Magic into new territory outside its comfort zone (high-epic fantasy in “The Crystal Empire,” after-school special in “One Bad Apple,” surreal psychological study in “Sleepless in Ponyville”) or pulling the standard-issue stunts of a flailing TV show (“evil” twins in “Too Many Pinkie Pies,” the return of a fan-favorite one-shot character in “Magic Duel,” the “boot camp” episode “Wonderbolts Academy). All of these episodes represent trial-and-error attempts to throw ideas at the viewers and see what sticks. And then there is this episode. The day after the solstice, the episode after the midpoint of the season, where Applejack keeps trying to force the magic into her reunion instead of just letting it happen. Again and again she throws activities at her family or tries to “improve” the old familiar activities they enjoyed in past reunions, making everything bigger and flashier, and in the process all she does is drive the magic further and further away. In the end, only catastrophe can save her. The barn comes crashing down, her family comes together, songs are sung and memories are forged, and a barn indistinguishable from the original rises again. After that comes a return to the traditional reunion, the activities that worked before. Quieter and calmer than what Applejack had planned, but with space to fit people into it. And so we can take away two things from this. First, we once again need a catastrophe, a massive and tumultuous change that can then turn out, from the far side, to be not that big a change after all. Second, Friendship Is Magic needs to calm down, stop panicking about losing its parent, and return to what it does best: selling toys to little girls while being vastly better than anyone ever expected a show designed to sell toys to little girls to be. Too bad we’ve still got four episodes of standard-issue TV flail-stunts to get through first. Next week: My two least favorite major characters get an episode together. Whee. Option 2: Go to http://webchat.freenode.net/. Enter a nickname, then for the Channels field enter ##rabbitcube, and finally fill in the Captcha and hit Connect! We’ll be watching the episode and commenting there starting at 3:00 p.m. EST. However, I will probably not be participating because I’m busy with family stuff, so I’d appreciate if one of you could copypasta the chatlog to a comment. Whenever I actually watch the episode, I will update this post with my own responses. Speaking of which, I updated last week’s liveblog a couple of days ago. Chatlog for “Leap of Faith” below the cut! [21:55] <Froborr> Is this a Granny episode? [21:55] <Froborr> Granny is the best Apple! [21:55] <Froborr> And this silent film thing is awesome. [21:56] <Froborr> You know, the opening credits need a couch gag. [21:56] <Froborr> Like, maybe the final picture is slightly different every episode. [21:57] <Froborr> Dear Princess Celestia: Today I learned that athletic competition should be left to the races that are good at it. [21:58] <Froborr> OH MY GOD THE FLIM FLAM BROTHERS! [21:58] <Froborr> I did NOT expect them to come back! [21:59] <Froborr> Oh my god Doctor Whooves for the better time! [21:59] <Froborr> YES now they’re the medical-industrial complex instead of ust generic capitalism! [22:00] <Froborr> Fun fact: snake oil actually IS good for you, it’s full of Omega-3. [22:00] <Froborr> THEY EVEN HAVE AN AUDIENCE PLANT THIS IS THE BEST! [22:00] <Froborr> Oh no. Poor Granny. She’s pondering getting them to heal her hip, isn’t she? [22:00] <Froborr> This is why I never hope. Hope is evil. [22:01] <Froborr> Also, given that I’m watching Baccano! at the moment, this is gaining extra creepiness. [22:02] <Froborr> Wow, that was quite the final sting. [22:03] <Froborr> No, there’s no tonic in Equestria that can make an old pony young again, but it’s amazing what a dose of confidence and some old-fashioned placebo effect can do. [22:03] <Froborr> Granny is going to hurt herself so bad. [22:04] <Froborr> The tonic is about 80% Flim-Flam pee and 20% year-old cider. [22:04] <Froborr> Farm pony with big glasses? He’s going to turn into Superpony, isn’t he? [22:05] <Froborr> This is the episode where Applejack teaches someone an important lesson about Honesty and gets her crystal coffer key, isn’t it? [22:05] <Froborr> And it’ll be Shill that learns the lesson. [22:06] <Froborr> Apple juice and beet leaves? Ew. [22:07] <Froborr> Hmm, this is actually a good dilemma for Applejack! Honesty vs. her family’s happiness! [22:07] <Froborr> And now Applejack is morally complicit in everyone hurt by the fake tonic. [22:08] <Froborr> Either you have somehow forgotten that the tonic is fake, or you are hatching a Wacky Scheme ™ liable to get your GRANDMOTHER injured! [22:09] <Froborr> Hmm, I’m noticing a lot of the same ponies in line as earlier in the episode. [22:09] <Froborr> Nothing so toxic or easily manipulated as hope. [22:10] <Froborr> Yep, and that’s why people with a reputation for honesty have an obligation to actually be, y’know, honest. Including with themselves. [22:10] <Froborr> Okay, their routine is actually really beautiful. [22:12] <Froborr> This is quite possibly the best Applejack episode ever. [22:12] <Froborr> Applejack is going to end up breaking the record, isn’t she? [22:13] <Froborr> Or not. Dang. [22:15] <Froborr> Jimmy Stewart! That’s who Shill reminds me of! [22:15] <Froborr> That is PERFECTION ITSELF. [22:15] <Froborr> Yeah, that bit is the next key, isn’t it? [22:16] <Froborr> Okay, yeah, that was a really good episode. [22:16] <Froborr> Not quite MAUD PIE good, but what is? [22:17] <Froborr> Though structurally, it was notably VERY similar to Rarity in Manehattan. Still, good stuff. Then: “Aha!” went the bells, and it floated over to my desk, where it settled down next to the camera. The light began to fade, to reveal a slender woman about five inches tall, with dark-chocolate skin, a pretty, triangular face, and a large (for her size) shock of pink hair. A pair of antennae protruded from high on her forehead, and four iridescent dragonfly-like wings from her back. She could not be anything but a fairy. Are deliberately confusing premieres a thing now? This isn’t to say I’m not enjoying it, just… that was clearly designed to be disorienting, which for me is intriguing, but it’s also surprising. Most series start out by trying to ease new viewers in, take them by the hand and explain things to them. There might be, for instance, a bizarre opening scene that will eventually be explained, but the entire first episode of Baccano! is essentially made of scenes like that. Again, I’m not complaining (except about Ladd, he’s horrifying and awful), just curious if this is starting to be a trend. Is it an adaptation thing? FMA:B is obviously based on a wildly popular manga, and Baccano! is based on a light novel series. Is the idea for the first episode to showcase all the characters and have a lot of cool moments for the current fans, as opposed to explaining things to new fans? Does that mean that, like FMA:B, the next episode or two will be about spelling things out for us newbies? Well, I guess I’ll find out as I go. THIS IS A SPOILER-FREE POST. PLEASE DO NOT POST ANY SPOILERS IN THE COMMENTS. IF YOUR COMMENT REVEALS KNOWLEDGE OF *ANYTHING* NOT APPARENT WITHIN THE FIRST EPISODE OF BACCANO!, PLEASE DO NOT POST IT HERE. Great panels: Charles Dunbar and Kat Paige’s Kill la Kill panel convinced me to give the show a second chance by arguing that it’s readable as a criticism of State Shinto and the resurgence of nationalism in contemporary Japan. Kat’s panel on tricksters and Charles’ panel on Studio Ghibli were also great. I finally got to see the Geek Family’s panel about happy and silly shows, and it was as good as I hoped and full of things I’d never heard of. Other highlights included the latest versions of the perennial Craziest Mecha Moments and Bad Anime, Bad (I can now say that I have seen all of the train wreck that is Garzey’s Wing), and a couple of panels by people I don’t know, one on music in anime and the other on visual storytelling in Miyazaki films, both of which were fascinating new perspectives given my usual focus on the verbal. Great panel audiences: Anime Boston continues to have the best and most interesting audiences of any convention I go to. The questions I got during both Postmodern Anime and Analyzing Anime were solid, interesting, and occasionally challenging, and Latin Latin Madoka More Latin resulted in two separate multi-hour conversations with attendees, the first about epiphenomenology, qualia, and theory of consciousness, and the second about Buddhism. The latter has already significantly altered my perception of what’s going on in the last three episodes of the series and Rebellion. Ego boosts: I was asked for an interview, invited to speak at another convention (which will take some negotiating, since it can only happen if they pay at least hotel cost), and, best of all, asked if I taught a class anywhere. So yeah, hung out with friends, recharged, and generally had an excellent time that has rejuvenated my seriously flagging convention mojo. Option 2: Go to http://webchat.freenode.net/. Enter a nickname, then for the Channels field enter ##rabbitcube, and finally fill in the Captcha and hit Connect! We’ll be watching the episode and commenting there starting at 3:00 p.m. EST. However, I will not be participating because I’m at Anime Boston, so I’d appreciate if one of you could copypasta the chatlog to a comment. Whenever I actually watch the episode, I will update this post with my own responses. [02:28] <Froborr> Rarity ep? Rarity eps are fun. [02:28] <Froborr> …Bwah? Isn’t this the order Sapphire Shores placed back in season 1? [02:29] <Froborr> Sweetie Belle, you are being selfish. [02:31] <Froborr> Sweetie Belle is going to turn into a control freak director, isn’t she? [02:33] <Froborr> Ah, this is going to be about Sweetie Belle being overshadowed by her more talented sister, eh? [02:34] <Froborr> Sweetie Belle sounds very Diamond Tiara-like in that rant. [02:35] <Froborr> Great, an Idiot Plot. [02:35] <Froborr> JUST EXPLAIN WHAT THE PROBLEM IS, SWEETIE BELLE. [02:36] <Froborr> WTF Sweetie Belle, why are you evil? [02:37] <Froborr> I like how this obvious ream sequence has noticeably less depth of field than usua. [02:37] <Froborr> I don’t think that would have worked in previous episiodes. [02:38] <Froborr> Okay, I *do* like the Luna-Sweetie Belle character parallel. [02:42] <Froborr> Meh, extended predictable dream sequence is extended, predictable. [02:43] <Froborr> At least we’re probably getting a chase sequence? [02:44] <Froborr> Bald security pony is the best. His cutie mark is a lock! [02:46] <Froborr> Okay, so you can STOP AND EXPLAIN NOW. [02:46] <Froborr> Never mind about liking the chase sequence. [02:49] <Froborr> Eh, that episode was okay but not great. [02:49] <Froborr> I *am* liking Dreamwalker Luna, but this wasn’t the best execution of the concept.